Chorus and Flanger effects operate on a very similar basis, that's why they were both implemented in the Liquid Mod II. 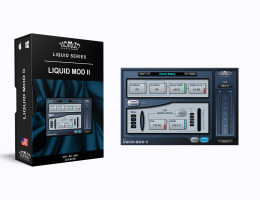 The Liquid Mod II produces vintage tape flanging, gentle choruses, sharp phasing, phaser-emulation effects and a variety of dual-delay-modulation sounds quickly. It has the character of a vintage chorus-flanger unit using modern features options. Analog or Digital processing modes. Sync to the host's tempo. Ouput level and Mix controls..